The nights are getting longer and the weather's getting colder now that fall is finally making its official appearance (after all those randomly hot summer-like days). What better way to warm up than with a bowl of soup? And of course it's always nice to have something to accompany the soup. I chose to cook up a pot of tomato soup since Halloween's right around the corner and the red-orangeness of the soup just seems to fit... evoking thoughts of blood and vampires. To accompany the soup, I thought it would be fun to make some bone-shaped grissini to further play on the Halloween theme. 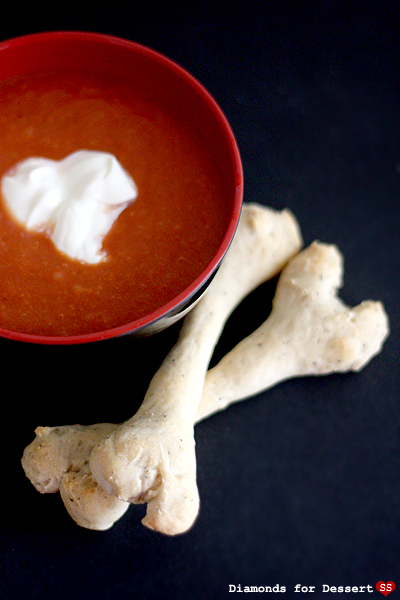 A bowl of creamy tomato soup with a dollop of creme fraiche accompanied by a couple of peppery bread sticks make a delightful way to enjoy autumn. 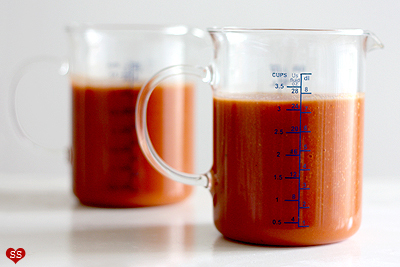 Mix together 2 cups of the tomato juice with the milk. Heat a saucepan over med-high heat and melt the butter. Add the chopped onion and oregano and saute for about 3 minutes, until the onions are soft. Then add the garlic and red pepper and cook for 2 minutes. Mix in the flour, stirring for one minute until no longer raw. Whisk in the tomato juice/milk mixture slowly to prevent lumps from forming. Let the mixture boil until bubbly and thick. Then add the sugar and salt. Add in the last cup of tomato juice, reduce the heat to low, and let simmer for 45 minutes to an hour. Add more salt if necessary. Then, either use an immersion or a regular blender to puree the soup. Place 1/4 cup water in a small bowl and heat in the microwave till warm to the touch. Add the sugar, then the yeast and mix. Let the yeast proof till bubbly 5-10 minutes. Mix the flour, pepper, and salt in a large bowl and form a well in the center. When the yeast mixture is ready, pour it into the well with the rest of the water and the olive oil. Mix until a dough forms and knead it for 5 minutes. Cover the bowl with plastic wrap and let the dough rise for 90 minutes, or until doubled. Preheat the oven to 350°F. Once risen, punch down the dough. Line baking sheets with parchment paper or nonstick sprayed foil. 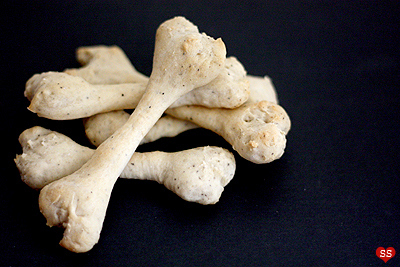 Pull off bits of the dough and make 4-inch long "bone" shaped pieces with skinny centers and knobby ends. 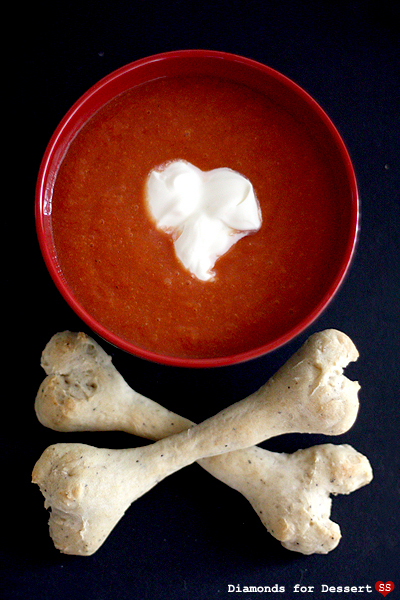 Split the knobby ends in two to make the bread sticks even more bone-like in appearance. Place the grissini on the baking sheets once shaped. Bake for 25-30 minutes or until crispy; if they start to brown too much, cover them with foil. How amazing is this? I love dem bonz..and the whole idea. Brilliant! These are awesome! Thanks for sharing :). mmmmmm~ soup sounds awesome right now, even though it still hits around 80 degrees here. Mel: Wow, huge weather difference between here and Socal, it was raining and cold yesterday. But soup is good all the time :). 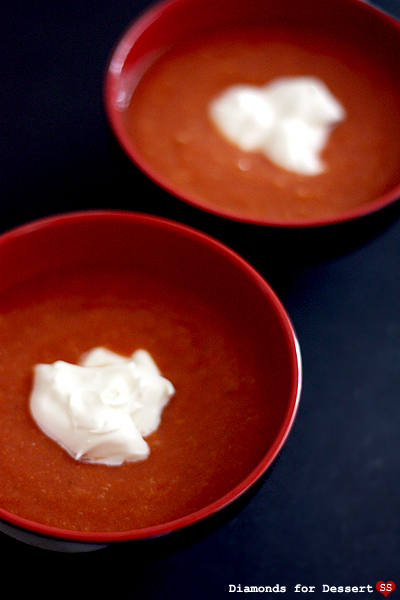 olyvia: Yeah, tomato soup is perfect for chilly autumn evenings. Thanks! Steph: Hehe, you should. Even better than from a can. those bones look SO GREAT! Christina P: Thanks. I hope that means they look bone-like :). eatingsumo: Why thank you :P! This is amazing. I'm definitely making this for my boyfriend some night very soon and I think I'll pair it with those adorable pirate hat pb cup cookies you made. Everything you do is so creative and clever I'm in love with everything. Thank you SO much for your detailed recipes and directions I can't wait to try them out for myself. Sarah: Thanks! Make them for friends! That's what I did. CamarilloBrillo22: You're welcome! Thank you for the sweet comment. I hope it all turns out well :).